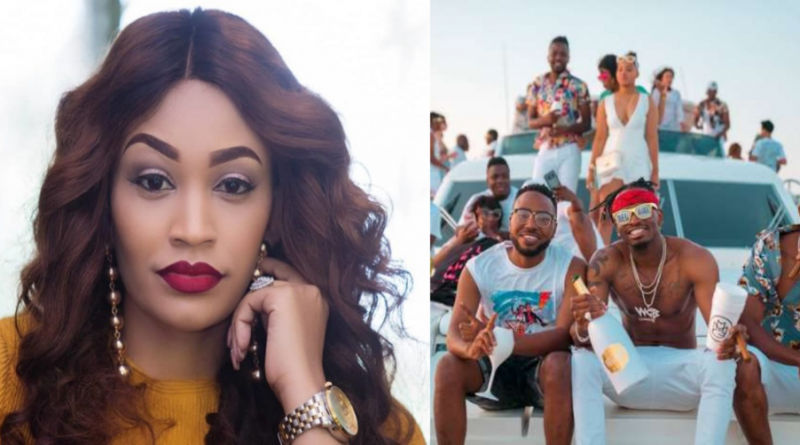 It’s no news that Zari Hassan and her estranged lover, Diamond Platnumz are among the greatest enemies of the recent times in the entertainment world. Zari has taken several digs at Diamond in the past, and she doesn’t seem to stop anytime soon. Just the other day, she uploaded a post on her Snapchat account revealing how she is enjoying her family time with her kids. The Ugandan socialite captioned an insulting message directed to Diamond for ‘neglecting his children’. Zari criticized her ex-lover, Diamond Platnumz for not giving their children the fatherly presence that they need. She also included that money can never buy love or family time. She mentioned that the two children needed a ‘real father’ to play the role of Santa. And the beef is back on between Diamond and Zari. And while Zari is taking jabs at her former spouse, Diamond has been visiting South Africa to spend some time with her kids. Apparently, Zari doesn’t think Diamond is sacrificing enough time for their two kids. But the African Beauty hitmaker has been spoiling his young ones with expensive gifts whenever he is in South Africa. He even uploaded a video of him and their kid, Latifah Dangote, and they seemed to be having a good father-daughter time together. Zari claims that her younger brother has always played the role of a father to their kids, which she appreciates a lot. The Ugandan beauty said once that her kids have already forgotten how their daddy looked like. She claimed that Diamond was a complete stranger to their lovely kids, Latifah Dangote and Prince. But that doesn’t seem to be true, especially after the flashy singer uploaded a video the other week with her daughter Latifah. Zari might be having a good time with the kids, but that hasn’t stopped Mr. Platnumz from having a blast as he celebrates his 29th birthday. Diamond threw an all-white $500-a-ticket yacht party, and only 30 tickets were available. However, the 30 slots were only available to those that could afford the ticket fee. Family and friends were invited [for free, of course]. Surprisingly, Zari and Diamond wished each other a happy birthday on social media, which made many followers think that the two have settled their differences. But it is clear that all that was nothing but mere words. The two seem to be at war, again, and this could go on and on. They broke up this year on Valentine’s Day, and they have been attacking each other on social media ever since. Zari seems to be the one who always starts the war. Mr. Platnumz hasn’t responded to Zari Hassan’s Snapchat post, but he doesn’t seem to give a hoot, or does he? Whatever the case, he will most likely give his thoughts on what Zari said.